18 holes of stroke play qualifying. This qualifier is limited to 156 players. The Pennsylvania Golf Association WILL NOT have a sudden death play-off to determine the final qualifying position for the Championship. The Association will be taking the number of qualifying positions allocated for the qualifying site and ties to the championship Proper. Practice rounds will be available any time based on club availability. Please call the golf shop at 717-599-5162 up to one week in advance to schedule a tee time. Practice round fee: $30 includes cart, cart required for practice round. Payment methods include Cash, Visa or Mastercard. Will be open approximately one hour prior to the first starting time. Please be at your starting tee at least ten minutes prior to your starting time. Carts are MANDATORY at the request of the host club. Cart fee of $35 will be collected during time of entry. Will be available for purchase in the clubhouse. The Middle-Amateur Championship will be played over 36-holes of stroke play. First round, 18-holes. Players will be re-paired according to first-round results. Second round, 18-holes. The Middle-Amateur Championship is open to any male amateur golfer who is a member of a club belonging to the Pennsylvania Golf Association or is an individual member of the Pennsylvania Golf Association and who have reached their 25th birthday by Sept. 16 and who have a handicap index of 7.4 or lower. The Middle-Amateur Championship field is limited to approximately 110 entries. The field will consist of exempt and at-large players. Each entrant, not exempt, shall compete in a sectional qualifying event to determine the field. At closing, it will be determined how many spots are available for qualifying once exempt players have been identified. All entries must be received by 11:59 p.m. on the entry closing date. Entry fee for the Middle-Amateur is $180 which must accompany entry. 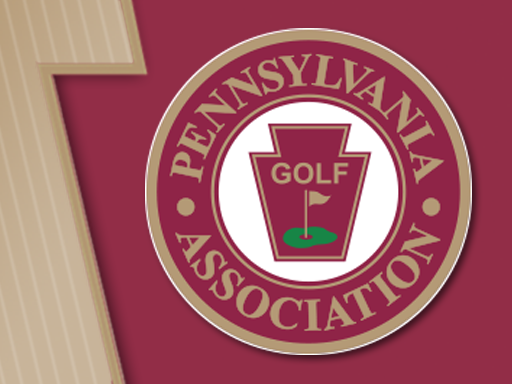 Players who have been accepted as participants in Pennsylvania Golf Association championships will receive event information concerning course assignment, practice rounds, pairings, and starting times approximately 10 days prior to the event. If you have not received your information seven days prior to the event, it is your responsibility to contact the Pennsylvania Golf Association. Information can also be found at www.pagolf.org. The PAGA staff, following as closely as practical the preferences indicated on the entry blanks will determine pairings and tee times. Contestants will be notified of starting times by mail. The "Official Time" will be maintained at the starting tee(s) only. Starters will not page players in advance of their starting time. Players should report to the tee one starting interval prior to their tee time. 1st round results will determine 2nd round pairings. Carts will be optional in the championship. Players may walk and carry, bring their own caddie, or hire a club caddie, if available. Pull carts are NOT permitted. Payment options are Visa or Mastercard. The player returning the lowest 36-hole score will be awarded the title of Middle-Amateur Champion and his name engraved on the Max Banzhaf Trophy. Prizes will be awarded to top 10 places. Prizes will also be awarded to the team (team members must be from the same club) that posts the best 2 scores of 3 for the two rounds of the event. In the event of a tie for the Middle-Amateur Championship there will be a sudden-death playoff immediately following the conclusion of play Tuesday afternoon. All other ties will be broken by matching scorecards in accordance with USGA guidelines. In the event of a tie for the final qualifying positions in an Middle-Amateur qualifier, the number of qualifying positions plus ties will gain entrance into the Championship Proper. Practice rounds will be available after 1pm on Sunday, September 16. Players must call the golf shop at 610-758-7190 to schedule a tee time. Payment methods are Visa or Mastercard. Walking is permitted, Pull carts are NOT permitted. Will be open approximately one hour prior to registration.